ONE OF THE UK'S MOST PROLIFIC AND INFLUENTIAL rock bands, UFO has built up an extremely loyal and dedicated fan base. The band's musical influence can be seen across a host of modern metal artistes  proving that it's not just the fans that have their eyes on UFO's abilities! Blasting their way into hearts and ears everywhere comes the phenomenal UFO with all the energy the band could muster when they released these three wonderful albums: No Place To Run; The Wild, The Willing And The Innocent and Mechanix, all shining examples of UFO's remarkable talent. 2008 saw two sets of UFO reissues, with combined OTC sales currently standing at 21,000 units. The third set is now ready for release and features three albums from their most commercially successful period. The original albums  No Place To Run; The Wild, The Willing And The Innocent; and Mechanix  have all been digitally remastered, now contain previously unreleased bonus material and are accompanied by sixteen-page booklets housing extensive inner notes, rare photos, press clippings and much more. 1 Alpha Centauri (2009 Digital Remaster) | 2 Lettin' Go (2008 Digital Remaster) | 3 Mystery Train (2009 Digital Remaster) | 4 The Fire Burns Tonight (2009 Digital Remaster) | 5 Gone In The Night (2009 Digital Remaster) | 6 Young Blood (2009 Digital Remaster) | 7 No Place To Run (2009 Digital Remaster) | 8 Take It Or Leave It (2009 Digital Remaster) | 9 Money Money (2009 Digital Remaster) | 10 Anyday (2009 Digital Remaster). 11 Gone In The Night (Alternative Studio Version) | 12 Lettin' Go (Recorded live at the Marquee, London 16 November, 1980) | 13 Mystery Train (Recorded live at The Marquee, London, 16 November, 1980) | 14 No Place To Run (Recorded live at The Marquee, London 15 November, 1980). 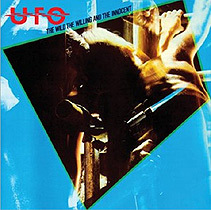 UFO'S NEXT ALBUM  The Wild, The Willing And The Innocent  was self-produced and represented a move back to the basics of their hard rock tradition, reaching Number 19 in January 1981. The album is full of beautiful numbers and the bonus material on the remaster includes previously unreleased live tracks taken from concerts at the time. Among such greats it's difficult to choose the special tracks, but the musically-accomplished title track, The Wild, The Willing And The Innocent is one and It's Killing Me and Makin' Moves are two more than are created in the true spirit of rock 'n' roll  this is what makes it all worthwhile. The emotive rock track Lonely Heart and melodic Profession Of Violence are both terrific. 1 Chains Chains (2008 Digital Remaster) | 2 Long Gone (2009 Digital Remaster) | 3 The Wild, The Willing And The Innocent (2009 Digital Remaster) | 4 It's Killing Me (2009 Digital Remaster) | 5 Makin' Moves (2009 Digital Remaster) | 6 Lonely Heart (2009 Digital Remaster) | 7 Couldn't Get It Right (2009 Digital Remaster) | 8 Profession Of Violence (2009 Digital Remaster). 9 Long Gone (Recorded live at The Hammersmith Odeon 29 January, 1981) | 10 Lonely Heart (Recorded live at The Hammersmith Odeon 29 January, 1981) | 11 Makin' Moves (Recorded live at The Marquee, London, 15 November, 1980). THE THIRD REMASTER IN THIS SET (and UFO's tenth studio album) signposted the departure of a founding member and bassist, Pete Way. With that change came a new, cleaner sound and their highest chart success to date at Number 8 in Feb '82. Again, the Mechanix album is a collection of great numbers with three of the four rare bonus tracks previously unreleased live tracks. Great tracks abound but The Writer really rocks. Doing It All is a fantastic, creative track and the whole album sits nicely together as a superb whole. With a great American sound, Let It Rain pours out with ease and Terri is a fine, slow beat track that has its merits. One really tremendous track is Dreaming; that makes you want to get up and dance. Heel Of A Stranger is given a more unusual, rock ballad treatment that stops you in your 'tracks'. And, as usual with live recordings, you are brought just that little bit closer to UFO.  UFO's EMI Records New Catalogue Releases No Place To Run; The Wild, The Willing And The Innocent and Mechanix are out now (Release Date: 19 January 2009).